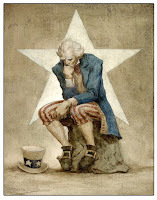 Home » american thinker , commentaries , commentary , personal reflection » Look! New article on American Thinker! Word you've never heard before within! Free toy inside! Look! New article on American Thinker! Word you've never heard before within! Free toy inside! I am very grateful and honored that American Thinker, a commentary site that I have long admired and respected, has published the third article that I have written and submitted for their consideration. "The Inthinkables" (I looked for that word on Google and couldn't find it already, honest) is about how too much of our society has yielded over its capacity for rational and critical thought and in its place has chosen an almost visceral and hair-trigger instinct toward reacting on the basis of "feelings" unfounded in logic and knowledge. In short: too many aren't using the minds they were born with. The rest of us are surrendering too much to them. The real thinkers are being harassed from public venues and good people like John Schnatter are being driven from the very businesses they founded and nurtured through their own effort and initiative. Critical and rational thought is being vanquished. In its place is a Randian horror of mental surrender. Orwell described Eastasia's dominant philosophy as "death worship," better translated as "obliteration of the self." I can conceive of no more fitting phrase. The academic world and the realms of entertainment and media have nurtured and encouraged too many to offer their minds as sacrifice to convenience and their souls to mass approval. Most have happily complied if they have been cognizant of having a choice at all. Nature abhors a vacuum, and so it is that the obligation for reason is abdicated for the intoxication of emotion. At last, there is no logic whatsoever. There is only an instinctive response to sounds and sights that seduce or offend. For some, the condition may be irreversible. So kindly allow me to introduce a new word into the English lexicon: "inthinkable." If you're on the fence about clicking on over to read it, the op-ed invokes Blazing Saddles and Pat Sajak. Among other things. But you'll just have to find out yourself. "The Inthinkables", only at American Thinker. Load your copy today!